What a marriage this will be! Our words cannot express the gratitude we have for You. Discovering Your love has shaken our lives and since then our greatest desire has been to give up everything for You and belong to You. Thank you for this wonderful call to holiness in marriage which gives us great joy. This beautiful path, at times stony, has taught us that love means giving life to the one we love. We are aware of our littleness facing this challenge. Teach us to love more everyday, give us the grace of becoming good parents, who will lead your children to You, let love in our family be a shelter for all the people you send us. We are open to fulfilling Your will. Dear God, we love You and we love Your goodness. I attended many weddings in my life and I cried at most of them. This one, however, was special. As you can image, at a Polish-French wedding it was very international. The atmosphere, however, was primarily missionary. Both Nina and Yohann, associated with Heart’s Home, inspired the arrival of many friends from around the world. These are the kind of people who make the impression that you’ve known them since forever. At the wedding reception in the middle of the forest, almost completely prepared by friends and family, everyone could feel at home – accepted and loved. Following a French custom, we were able to hear speeches of many guests about the newlyweds and they all touched our hearts by showing how both of them changed the lives of so many people around them. And at the end of the Mass they played my beloved Alma Misionera!! The first time I heard this song at the Provincials’ meeting in Poland in 2014 and I knew immediately that it was about me and my missionary soul. 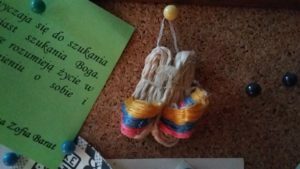 This memorable prayer was accompanied by the symbol of tiny Colombian sandals that are still hanging on my cork board, reminding me that missions are not about travelling abroad, but about being next to those who are hungry for God’s love and compassion. 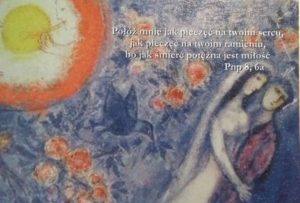 I am a religious sister from the Society of the Sacred Heart in Poland. In June 2015 I have made my first vows and started work in Gdynia as a catechist. 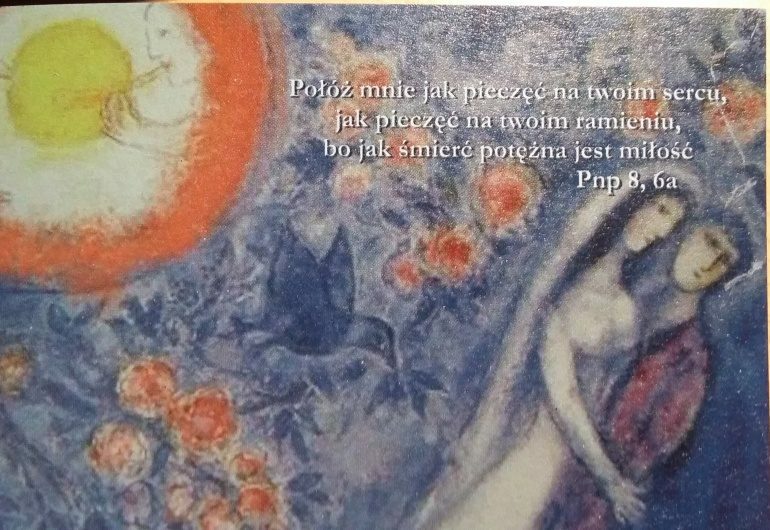 Now I live in Poznań and am responsible for the Vocation Ministry. This entry was posted in God is good. Bookmark the permalink.